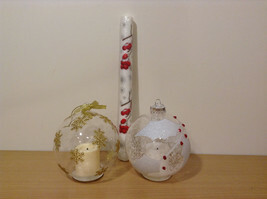 Christmas Home Decor Two Ornament Glass Balls with Flameless Led Candles inside and one flame-less candlestick. Some candles may need new batteries. For indoor use. Measurements: Balls: 4.5" Tall, about 4" diam. Stick: 10" tall, 1" diam.